When you drive into Anna Nagar through the Anna Arch and past the Arignar Anna Hospital, it’s easy to miss the low-income colonies on either side. Along the narrow alleys that lead to MM Colony, women are busy making hot dosas from their make-shift stalls for men, who work at shops nearby. Those who keep the big bungalows neat and tidy and the elite shops squeaky clean are men and women who live in small houses in these alleys. For the political parties fighting it out at Anna Nagar, it’s a battle to get the votes of the lower income households and slums, far detached from the posh perception that Anna Nagar has. “Everyone thinks that Anna Nagar is an elite constituency, it is not,” says S Gokula Indira, the Handlooms Minister and present MLA of Anna Nagar. “Nearly 65% of the votes here are from slums and lower incomes groups. There is about 15% middle class, and the rest would be the elite. And I am focusing on the slums and small colonies here.” Gokula Indira is among the very few AIADMK candidates who have been allowed to contest from the same constituency once again, a sign of her fierce loyalty and obedience to Jayalalithaa. Few minutes earlier, Gokula Indira was in a small church inside MM Colony. Flanked by AIADMK’s Rajya Sabha MP Vijila Sathyananth, Gokula Indira was standing in front of the congregation, eyes closed and her hand held up in worship. In his heavy evangelical tone, the priest chanted, “With the blessings for Lord Jesus, not only will the AIADMK come to power here, but also in Delhi.” With questions being raised over her alleged inaction in the immediate aftermath of the Chennai floods, Gokula Indira is leaving nothing to chance. The focus of her campaign is appeasing those living in slums, where the anger was palpable. There are around 13 slums in Anna Nagar. Out of the seven wards in the constituency, only three are “bungalow areas”, or upper class residences. Not only do more people live in the poorer wards but the voter turnout is also higher here. People living on the banks of the Cooum, considered encroachers, have been fighting against ‘rehabilitation’. The city has been trying to move the poor out of the hutments by the river, and it has become a hot political issue. “We want to assure all those who have been living for 60-70 years that they will be allowed to stay there, only recent encroachers will be asked to move,” she says. 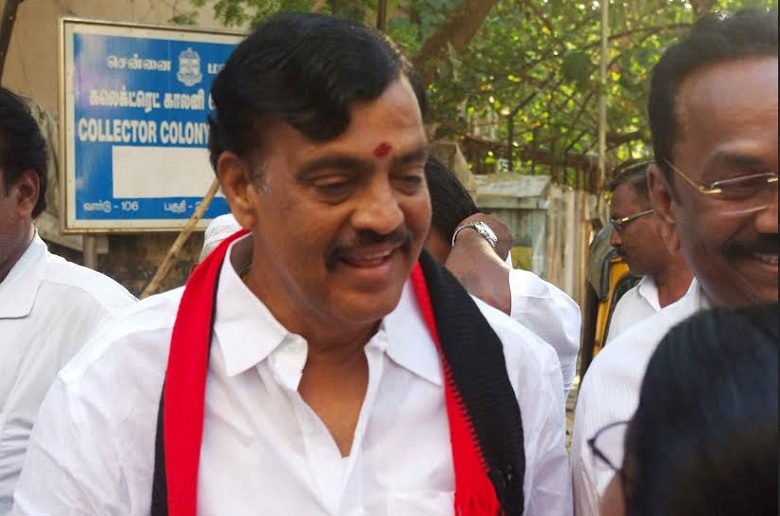 DMK’s MK Mohan is a first-time contestant and a former councillor from Anna Nagar. His father Kodandapandi Naidu was a Congressman and a two-time councillor from the same area. The family has been around here for more than 50 years, and know the people and the constituency. Mohan’s family also has the finances to back him, with assets worth more than Rs. 170 crore. He also hopes to gain from the large Telugu community living in Anna Nagar given that his family were early Telugu settlers in the neighbourhood. A community man with roots in Anna Nagar and the anger over the floods are the two things that MK Mohan is counting on to see him to victory. Being an urban constituency, people are feeling the financial pinch too. “There is no money in our hands, whatever comes goes away,” says Muthumma, as she swiftly spreads dosa batter on a hot pan in one of the by-lanes. “And if she starts giving people cheap idlis and dosas also, where will our businesses go?” she asks, referring to the popular Amma Canteens. MK Mohan’s son Karthik is the lead man running the DMK campaign in Anna Nagar. Sitting in his plush office in Anna Nagar, with campaign workers running in and out with schedules and plans, he explains that they are banking on this anger over the floods, and the fact that people have limited savings. Karthik is a young, suave businessman, and speaks the language of the city’s elite, “But it’s not easy to campaign in those areas, and the minute my sister and I enter to seek votes for my father, they ask us to get back later.” But he is trying hard, and has printed swanky pamphlets aimed at the area’s elite. For them, it’s not about the candidates, but the leaders and how they affect their lives.